Mikkel Boedker has not received a tremendous amount of attention in the aftermath of Game 3. Quite understandably, the attention has been focused on the Raffi Torres hit and its consequences for both the Phoenix Coyotes and the Chicago Blackhawks as the series moves forward. However, Mikkel Boedker’s performance was tremendously significant and a big part of why the Coyotes emerged with a crucial victory in Game 3. Mikkel Boedker did of course score the game winning goal in overtime. He shot the puck from a bad angle 13:15 into overtime and it somehow squeaked through Corey Crawford’s pads and into the back of the net. Scoring the game winner may have been the piece of luck that made Boedker the hero of Game 3, but he more than earned it. His 19:31 of ice time was a season high. With forwards Martin Hanzal and Lauri Korpikoski sidelined by injuries, Boedker’s role on the second line alongside Daymond Langkow and Shane Doan became even more important. That lines was arguably Phoenix’s best in Game 3 regularly creating offensive chances and they were on the ice for the Coyotes’ first goal with Boedker laying the perfect feed for Rostislav Klesla’s shot. On Tuesday he stepped up in other parts of the game as well. Phoenix’s penalty kill was hard pressed with Korpikoski and Hanzal both sidelined and Mikkel Boedker was pressed into service. He averaged just 21 seconds of short-handed time per game during the regular season and barely saw any time in the first two periods. However, Dave Tippett thrust him into action in Game 3 and he ended up seeing 3:34 of penalty killing time. Boedker’s performance on the penalty kill considering his inexperience was extremely impressive. He showed good a good stick, good anticipation and he even created a couple of decent offensive chances. 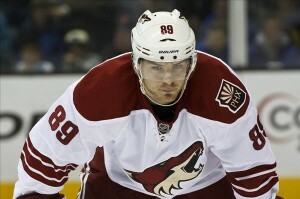 Mikkel Boedker is an offensive talent that Phoenix has been waiting to mature for sometime. The eighth overall pick in 2008 scored 73 points in 62 games during his final season with the Kitchener Rangers in the OHL. However, much like other Phoenix offensive prospects Brett Maclean and Kyle Turris he has failed to meet expectations at the offensive end of the ice. In 2008-09, he scored 28 points in 78 games, but similar to Maclean and Turris, he struggled to meet Tippett’s increased defensive standards and ultimately spent most of the 2009-10 season in the AHL. Unlike his fellow prospects though, he worked at all aspects of his game and earned Tippett’s trust in the coach’s second year. He played in 34 regular season games and got his first taste of playoff action playing in all four games of the sweep. While Turris was busy holding out for a big contract extension, Boedker earned himself a permanent spot on Phoenix’s roster and ended up playing in all 82 games this season. Tippett may deserve blame for not getting the most out of Turris, who has moved on to better things in Ottawa, but he definitely deserves credit for transforming Boedker into strong two-way player. The Danish forward managed just 24 points this season, but his improved overall game and game breaking offensive ability make him a valuable member of this roster. Game 3 may or may not signal the emergence of Boedker as a strong two-way top six forward, but with their current injury situation and the likely suspension of Raffi Torres, the Coyotes will take everything they can get from one of the team’s younger players.